The head of Vietnam's Communist Party advocated for the importance of market-oriented economic reforms on a two-day visit to old ally Cuba, which is struggling to liberalize its poorly Soviet-style command economy. Vietnam and Cuba are among the last Communist-run countries in the world but Hanoi set about opening up its centralized economy in the 1980s, two decades before Havana started to do so in earnest under President Raul Castro. Castro leaves office on April 19 after two consecutive five-year mandates without having been able to unleash in Cuba the same kind of rapid economic growth as that experienced by Vietnam. He remains head of the Cuban Communist Party (PCC) until 2021. "The market economy of its own cannot destroy socialism," Communist Party General Secretary Nguyen Phu Trong said in a lecture at Havana University. 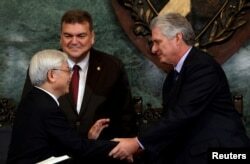 Vietnam's Communist Party Secretary, General Nguyen Phu Trong, shakes hands with Cuba's First Vice-President Miguel Diaz-Canel, next to Gustavo Cobreiro, rector of the University of Havana, in Havana, Cuba, March 29, 2018. "But to build socialism with success, it is necessary to develop a market economy in an adequate and correct way." Hanoi had managed to lift around 30 million Vietnamese out of poverty over 20 years, Trong said. The PCC this week admitted a slowdown in its market reforms it attributed to the complexity of the process, low engagement of the bureaucracy and mistakes in oversight. The number of self-employed workers in the Caribbean island nation of 11.2 million residents has more than tripled to around 580,000 workers since the start of the reforms. But the government last year froze the issuance of licenses for certain activities amid fears of rising inequality and a loss of state control. It has also backtracked on some reforms in recent years, particularly in the agricultural sector. Trong said it was clear Cuba, like Vietnam, wanted to avoid shock therapy. "With the clear vision of the PCC ... [Cuba] will surely reach great achievements and successfully reach a prosperous and sustainable socialism," Trong said. Cubans complain their economy suffers two types of blockades, the internal one, namely stifling state controls, and the external one: the U.S. trade embargo. Vietnam also suffered U.S. sanctions, but Washington lifted them more than two decades ago. Analysts say it is unlikely it will do the same for Cuba any time soon. U.S. President Donald Trump has shifted back to hostile Cold War rhetoric and partially rolled back the detente forged with Havana by his predecessor Barack Obama.